If you are pining for Spring already, well we can’t blame you. Plan ahead for a trip to the Keukenhof Gardens in Lisse opening March 20th. Holland is famous for its tulips and Keukenhof is a very good reason why. The winter months are sure to drag on so make your P&O Ferry booking from Hull to Rotterdam and get to Lisse when the flowers finally bloom. Up to 7 million bulbs are planted to create a vast carpet of tulips spanning the 32 hectares of open land. This is a hot spot for people planning towards Easter. There’s plenty to do there, Keukenhoff has it’s own hedge maze and petting zoo. Cyclists (who don’t suffer from hay fever) are in their element the flat country and scenic surroundings make it an ideal spot for a family bike tour. More events will be announce later in the year – the gardens stay open until May 17th. If that’s all a bit too far ahead then we have good news. The Netherlands will be celebrating National Tulip day on January 18th. Tulip growers transform Dam Square in to a island of vibrant horticultural beauty. 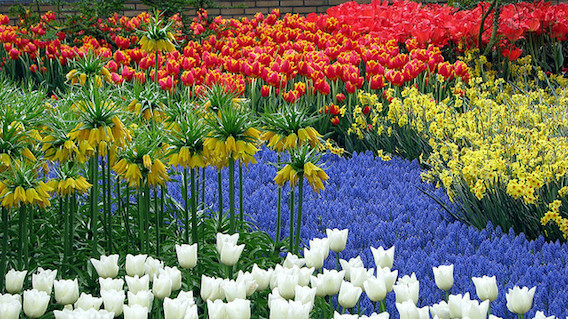 This is just the tip of the iceberg an anticipated 1.7 billion Dutch tulips will be brightening up the homes of flower fans everywhere this year and the gardeners of the Netherlands like to kick things off right. If you can make your way to Amsterdam this January then you’re allowed to pick a free bouquet of tulips. Since you’ll be passing through Rotterdam anyway when your P&O lands there take swing by the Kunsthal Rotterdam gallery. They have had Designing 007: Fifty Years of Bond Style on display since late 2014 but the exhibition closes on February 8th. Kunsthal Rotterdam houses 25 exhibitions annually so check in whenever you’re planning a trip to Holland and there’s bound to be something of interest on display. There’s no one particular type of exhibition at Kunsthal they vary it from the most avant-garde to traditional art of classic appeal. ‘Designing 007′ is an amalgam of all the best Bond imagery that we love the most. Dating right back to the first appearance of Connery in 1962 to Daniel Craig flying the flag in Skyfall James Bond is one the titans of the film industry. It therefore has had a massive effect on social trends, fashion and even technology. This exhibition displays the treasure trove that is the Bond archive – you’ll be able to get up close to all the gadgets and vehicles, admire the wardrobe of not just tuxedos but ball gowns and outfits of the numerous Bond-girls. 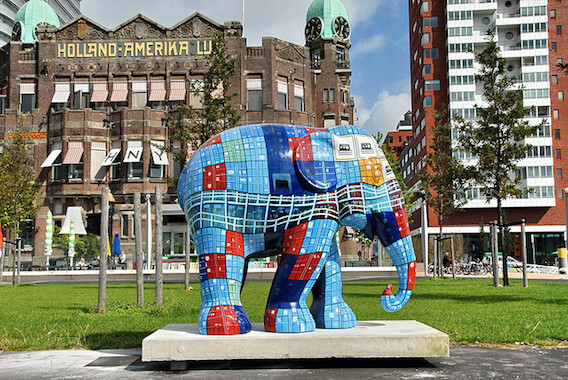 For those of you planning to rush out of Rotterdam on to different parts of the Netherlands we’d suggest you stop for a moment to take in the sights of Rotterdam. It doesn’t have to take long, have a ride up the Euromast. 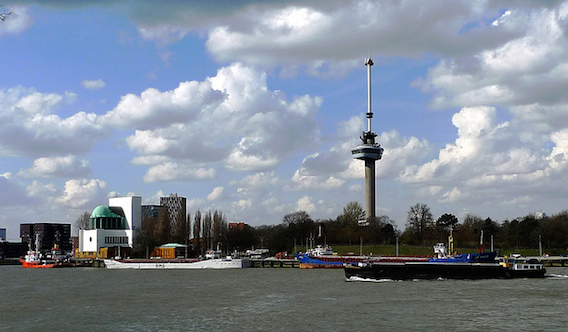 It’s the Dutch equivalent of the Eiffel tower – sort of. Spanning over 100m it commands an excellent view of the city and harbour. It’s a fantastic way to start off you holiday – by looking far afield at a new country to explore. The European Fine Art Fair, lovingly known as TEFAF, is now in full swing. You may not be an art critic but the chance to get an up close look at some of the articles for sale at TEFAF draws a large crowd. Maastricht will be hosting this event until March 22nd. Attendees vary from critics and dealers to academics and students, craftsmen attend to get an eye for the prices that certain pieces go for and trends can be set accordingly. All of articles are looked over by quality control experts so if you were looking to get involved then trust can be assured. Objects from around the globe and varying historical periods can be found everything ancient coins to medieval manuscripts and turn of the century jewellery can be found at TEFAF. P&O Ferries run an overnight service from Hull to Rotterdam, start your new year with a holiday to the Netherlands!